Would you like your lightbox nav arrows to be outside of your image? With Envira we give the option for your lightbox nav arrows based on the lightbox theme you choose. This tutorial will help you in setting your lightbox nav arrows outside of your gallery images. Why don’t I see the option for Gallery Arrow Position? Are the same options available for my Envira albums? Next, navigate to the Lightbox tab to select your lightbox theme. The ability to have the lightbox arrows outside of the gallery image will depend on the lightbox theme you select. 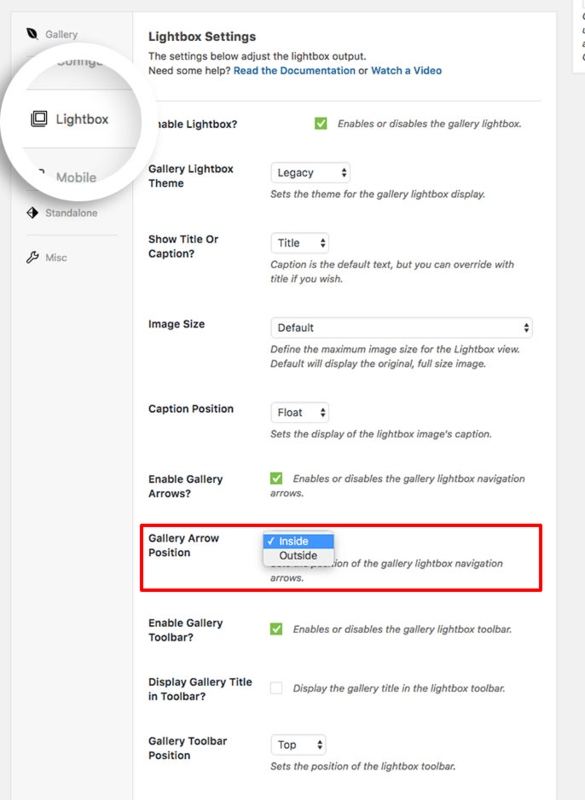 On the Lightbox tab, configure the Gallery Arrow Position field to show the arrows on the inside or outside. Finally, you’re last step is to click Publish or Update on your gallery to save the changes. And that’s it! You’ve now set up your lightbox to show your nav arrows inside (or outside) the lightbox image. If you’d like to learn more about Envira’s Lightbox, check out our article on Envira Gallery Lightbox Options. A: This is likely because you’ve selected either the Base (Dark) or Base (Light) lightbox theme. These lightbox themes will not allow you the ability set the Gallery Arrow Position. A: Absolutely! The Envira Albums works exactly the same as the gallery with the exact same settings for this option.